Comhaltas Archive THIS IS AN AMAZING COLLECTION!!! The Session.org a great way to lose 3 or 4 hours. Heard lots compliments on our group’s playing after the recital – great job everyone. Thank you for being there! So on to our last tune for this Spring – Spootiskerry which is a Scottish tune and a rollicking reel. 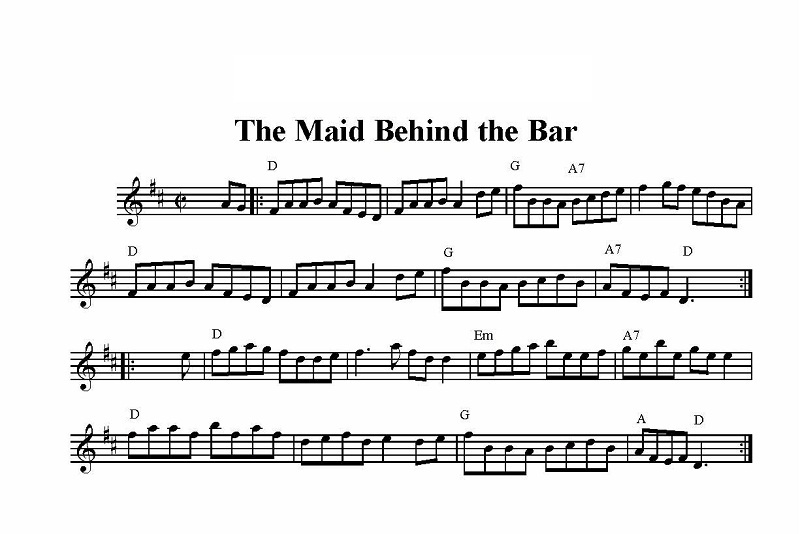 Here’s the sheet music and I’ve linked to a couple of youtube videos that should give you a good sense of the tune. Did you all wonder where the name came from? Me too… here’s what I found (gotta love google). “Spootiskerry – the croft belonging to my late great aunts Bella and Joan Nicholson, situated between the village of Sullom and the new town of Brae. Originally spelt Spootskerry, but as the years have passed, an “i” or an “a”, and sometimes an “o” have been added. The croft took its name from the skerry that lies offshore. Usually the house on a croft has the same name, but in this case the house is named Southness.” He adds that it was his first composition. and, it dates from 1980, and is a reel. What happened to the 7th class? Must have been really good (thanks again for covering, Erin!). Everyone sounded lovely on Tuesday. You may not realize it, but the progress you’ve made this semester has been fabulous. And it isn’t like we’re playing easy tunes – really impressive, everyone! In particular, we’re doing a much better job playing together and steadily. Way to go guitars for keeping a solid rhythm section going, but guitars can’t do it without melody players listening well to each other too. Remember that Sunday, April 28th at 2pm will be the recital. Please let me know if you will NOT be able to come. We decided that the two sets to consider will be the jigs (Tobin’s and Cliffs) and the Maids (Wise and Behind the Bar). We’ll make the final call on Tuesday, but I thought both sounded good this week. I’ve requested to Lori that we play right before Brock’s class, so that we can get a circle set-up for the two classes. 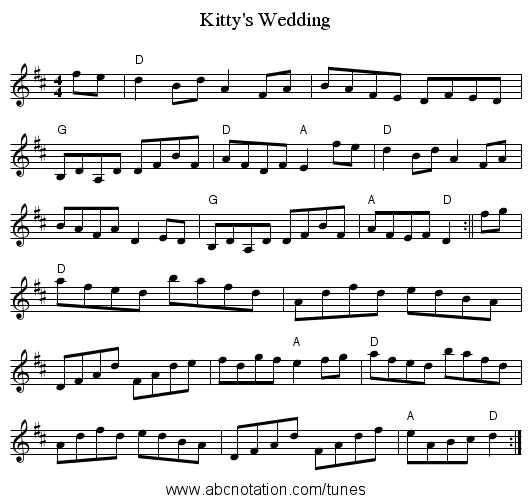 Here’s the notation for Kitty’s Wedding for Emily and others! Julie and Jim, take a listen to Pio’s version of Kitty’s from our class last summer – some excellent examples of triplets and variations, especially the F natural lead-in to the 2nd phrase in the A part. Remember, BRIMS isn’t having classes this week b/c of Spring break. Here’s the notation for Galway Hornpipe – our tune for next class. Thanks to Alex and Joe for sitting in on Kid on the Mountain, especially since we were missing Erin and Scott. That’s a really fabulous slip jig – and sounded pretty darn good that last time through. So, those of you who know a couple of slip jigs, be thinking about what you might want to pair with the Kid. Too bad there’s not a slip jig called Cassidy’s. This week’s tune is a 3 part reel called Musical Priest. Seems like an appropriate tune to learn the week of St. Paddy’s, yes? It’s also in Bm (two parts anyway), so it is good to get the patterns for a Bm tune in your fingers if you haven’t learned any before. They are somewhat rare, but very nice to put with D tunes – such as, haha, the Maids! As I mentioned in class, this was the most popular tune in the Claire sessions I listened to a few years back – played at 6 of the 7 sessions. The most difficult part of Musical Priest, especially for banjo players, is the reach on the 3rd part from the high B coming down. That will take a bit of practice to master. Note that I played it on mandolin – perhaps for Jim – or perhaps because the stretch is just so darn difficult on octave mandolin. Anyway, my apologies for the dishes clanking in the background. Sounds almost like we’re at a pub… we’re not, really… I swear. Speaking of recordings in pubs, a really fine CD that captures the feel of a session is “Live at Mona’s” featuring Patrick Ourceau on Fiddle and Eamon O’Leary on guitar. Lots of great tunes as well. Speaking of Patrick, he’s been the Irish fiddle teacher at Alex’s summer fiddle camp. For you fiddle players in class, that is an amazing opportunity to take some classes (and be treated to some fabulous playing) over a weekend in August. Yes, a blatant plug. It was a dark, rainy evening – perfect for Irish tunes – but we were missing a few folks. I’m counting on the fact that it was the weather (or other commitments) and not the difficulty of the tune that kept people away. Those who were there all agreed that Wise Maid was a challenging tune, but we decided to work on Maid Behind the Bar this week and we reassured ourselves that we’d have 8 weeks to work on the Maid Set. As I mentioned in class – I first “learned” these tunes a year or more ago, and I still don’t have them down solidly. I can play them at home 50/50 on my own, but in a group setting I rarely make it through without an error. My point being not to be hard on yourself with the Maids. They are very popular tunes, but also of a higher order of challenge. Those who kind of know them will benefit from working more on them, and those who are new to them will begin the process. No worries. Tobin’s sounded solid, but I think we could all stand a bit more work on the Cliffs, especially as part of a set. So we’re taking on the Maid Set – or at least Wise Maid. Both of the Maids are challenging tunes, so we’ll see how you all feel about it next week. But Wise Maid was at top of the “want to learn” list. For those of us who kind of know the tune, we’ll no doubt benefit from working on it some more. Guitars, Wise Maid can either be done very simply or you can have a blast with backing variations. We’ll start simply (single finger) but then will show you a few fun variations. Here’s the notation (and chords) from O’Flaherty’s. But again, I encourage you to learn primarily by ear and refer to the notation only for guidance or when you are stuck on a part. There are two recordings of the tune provided, one by Erin that moves along at a pretty good clip and slow version from Alex that I had recorded back when I learned the tune. Melody instruments may find Alex’s easier to learn from at first while guitars may find it easier to play along with Erin. You all sounded very solid on the two jigs. Frankly, I was planning on working on Tobin’s for this week, but you eager beavers all were ready to move on. We will play the two jigs again next week, so keep practicing them, especially as a set. Welcome everyone! Great to be starting up our class and to have both familiar and new faces. Based on the first class, I think everyone is in the right place, but if you have any concerns about that or anything else, please let me know. Our goal will be to learn one tune each week. I will pass out sheet music for the tune each week and we’ll have a recording on this site for reference. We won’t be learning the tune in a note by note, phrase by phrase way in class, but we will play the tune slowly in class together multiple times. If you can learn it that way, great, but I expect most of us to spend some time during the week to learn the tune on our own either from the sheet music or the recording. Also, if you have one of those weeks, and you can’t find the time to learn the tune, no worries. We’ll be playing most of the tunes we learn every week (yes, that means 10 weeks of Cliffs of Moher! ), so there will be ample opportunity to catch up if you’d like. This weeks’ tune is Cliffs of Moher, but I’ve also given you Tobin’s Favorite (next week’s tune) to work on if you already knew the Cliffs. The tune recordings will always be at the top of this post and each week I’ll post a few notes / thoughts about what we covered in class. We will spend most of our time in class playing tunes rather than chatting and I promise not to have quite so much coffee next class 🙂 Thanks for being willing to introduce yourselves and try out a few tunes. I hope to have a better sense of people’s repertoire as time goes on, and we’ll try to find some common tunes that people already know to try out each class, but if not, we’ll work on the tunes that we cover in class in more detail. New folks If you’re part of an open session and someone new comes to join in, it is nice to ask them for what tunes they’d like to play or to ask them start a set of tunes. You may have noticed that I was asking 3 or 4 people in particular what tunes they knew or what they’d like to play – this was because they were new to the class / group. Starting tunes If you are asked (or want) to lead a set – meaning 2-4 tunes played in succession – it is helpful to play a few bars of each tune that you’re planning on playing. It’s also helpful to the guitarists if you happen to know the key of the tunes. Last, it is important to let folks in the group know when your planning on switching from one tune to the next by either sticking your leg out or saying “hup” or “here we go” or doing that Irish thing where you look around at everybody with that knowing glance that says, “we’re about to change to the next tune”. You can also say “one more time” to indicate that you’d really like another go at it. Personally, I’m a stick my leg out person, probably left over from old time playing days. I believe the tradition of sticking one’s leg out was actually due to one’s leg cramping uncontrollably after playing an old-time tune 15 times in a row, though I could be wrong. Tunes and Songs Not the same! Silly, I know, but a tune is a tune and a song has words and is sung. Craic Pronounced crack. Irish for having a really great time as in, “ah, the craic was mighty last night”. Not to be confused with any of the other ones.